The LAMBDA MINIFOR bench-top autoclavable laboratory fermenter and bioreactor was developed as a result of the need to construct a small laboratory fermentor for working volume ranges from 35 ml to over 6 liters. 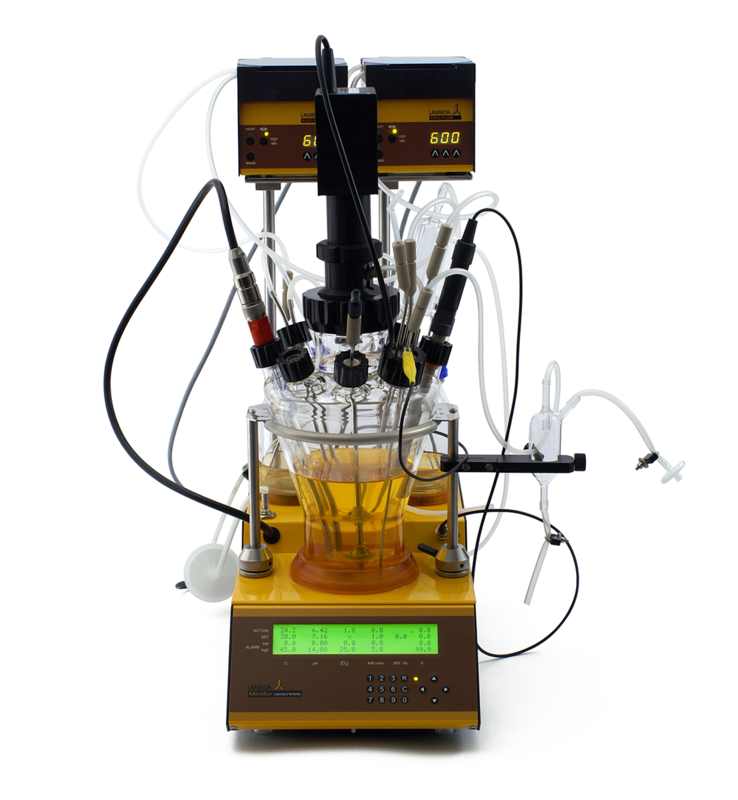 Based on long personal practical experience in fermentation and cell culture, a high quality fermentor-bioreactor which is easy to use and with the capacity to measure and control all the important parameters of the biological culture, has been created (which required new ideas and many innovations). The fermentor had to take up minimum space on the bench, but with good access to all parts. Several fermentors should, when placed side by side, be suitable for the optimization of growth parameters of the culture or optimization of bio-transformations, etc. (highly suitable for parallel running experiments). The space requirement of the MINIFOR fermentor-bioreactor with working vessel and the control unit is: 22 cm x 38 cm x 40 cm (W x H x D). LAMBDA MINIFOR fermentor and bioreactor can be fully controlled and operated from the front panel. All parameters can be immediately seen without scrolling and set values as well as high and low alarms of each parameter can be adjusted on the front panel. Several MINIFOR units can be connected to one PC and the optional fermentation software SIAM or FNet, allows remote control and data processing. For connecting multiple MINIFOR fermenter-bioreactor units to the PC, no additional software licenses needed. Instead of a fermentor flask with a stainless steel head plates, which is expensive, LAMBDA MINIFOR fermentor and bioreactor use whole autoclavable glass vessels (0.3 L, 0.4 L, 1 L, 3 L and 7 L) with threaded fittings. The bioreactor vessels have been used in fermentation & cell culture for years and are proved to maintain perfect sterility. Thanks to the LAMBDA easy sterility concept, the MINIFOR fermenter-bioreactor is set-up in the shortest possible time! Instead of a traditional propeller agitator, which requires an expensive motor and magnetic coupling, LAMBDA introduced a new up-and-down agitation in the bench-top fermenter and bioreactor. A motor together with an inexpensive membrane perfectly assure sterility and produce an efficient mixing without formation of a vortex (no baffles needed). At the same time, this up and down mixing is gentler on cells and produces less foam. Novel biomimicking “fish-tail” stirring discs together with the up and down agitation offers maximum mixing efficiency without cutting edges. The culture vessel is heated by heat radiation produced in a parabolic radiator with a gold reflector placed under the fermentation vessel. The heat is absorbed gently by the culture similarly to the sun heating water. No overheating of the culture at any volume and expensive double-wall vessels with thermostatic baths & heating blankets are completely eliminated. At the same time, tubing and cables disappear making the lab-scale fermentor less complex. Even the basic kit of MINIFOR lab fermentor-bioreactor is equipped with a thermal MASSFLOW gas flow controller for aeration and regulation of dissolved oxygen. MASSFLOW with proprietary precise and proportional needle valve allows to automatically control the concentration of dissolved oxygen (DO) by the flow rate variation and not merely by the variation in the stirring speed. We think that DO should be controlled at any stirrer speed! Or should one tolerate bad agitation at low DO values? As far as possible, expensive pieces of equipment have been replaced by new high performance plastics. By using modern microprocessors, it has been possible to place all the electronics in the front part of the instrument. This makes the fermentor unbelievably compact and eliminates the casing tower. Despite its small size, six parameters are measured and controlled in the basic configuration of the MINIFOR.